here is a limit to exhaustion. Like a fool, I drove the distance from Southern Ontario, Canada to St. Augustine, Florida in 18 plus a few hours, give or take a stop or two at Stuckey’s or the International House of Pancakes. 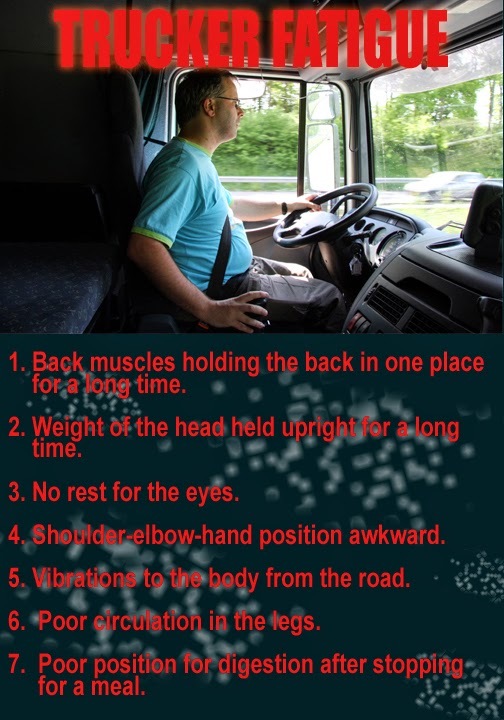 You grab onto the wheel and it becomes your coffin posture. Bladder, heart, brain merge with wheel, rubber and tarmac. That’s it; you sit. Truckers know this rock hard, desensitized compact with the road. A collection of thousands of miles will someday squeeze the life out of a trucker’s back; the left elbow will somehow someday let the pain escape; the grease from a thousand numbed down burgers will someday finally stay the heart –but for now, he will not move. Day after day he is involved in a strange relation where the truck covers great distances but trucker himself can’t budge inside his cab. Of course, you pay. Only after. The body takes days to unlock the fatigue that grips the bones with a fury. On holiday, you blank out on a beach…and pray you take your time on the way back. In the workplace, no such solace exists. If you’ve covered hundreds of steroid miles during your day, you better hope that the motor doesn’t keep running while you’re trying to sleep. Fatigue grinds. Sometimes muscles and bones are the coffee beans in the grinder; often the eyes, the head, the memory, the will to act, the problem of thinking and the sense of self are ground along with the body just for extra flavour. 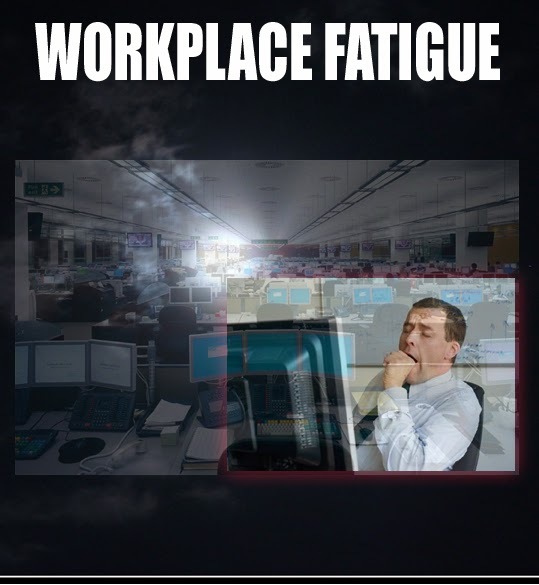 As a consultant to industry, I’ll come across two basic reactions to fatigue during my first visit to any workplace: pills, and/or the determination to ride all the slings and arrows out to the weekend. That’s it. We hope for the weekend. We’ll hang onto any machine or keyboard, by the nails if forced to, until we can drop onto the sweet lap of a weekend away from the everyday. Because we know weekends restore all of our body parts into a single healthy “I”. Yet all my experience in training, in Chi Kung, Five Element Theory, whatever, tells me that we’re beings constantly in flux trying to maintain a balanced centre. Sometimes that smooth control over workplace fatigue is interrupted somewhere between Monday to Friday or one shift to the next. The reason might be as small as something we’ve had for lunch. Or maybe one extra twist of the screwdriver. Or the cold outside. Or having “slept on the wrong side of the body”. Just something small has us momentarily rattled. In martial arts, I teach a contact drill where a partner is allowed to hit or take you down, not hard, but with enough force to be slightly jarring. I tell the student to stay centred. Not by being “in control” but by entering a state of mind which accepts the blow while remaining relaxed and calm. Again, the partner hits or takes you down. “Relax. It hasn’t drained your energy. Maintain your energy. Stay calm,” I say. Mondays in a stressful workplace is like the first punch; Tuesday happens to be the second punch; Wednesday the third, and so on. You may not be able to control the punches (in fact a big part of stress comes from stressors that seem to be beyond your control) but you can control your responses. You can prevent the ripple effect that fragments both mind and body. THE OFFICE – allergens on the floor, on the equipment and in the air; air quality itself; allergens from the heating system; electromagnetic disturbance from the equipment; lighting problems from the screens to the lights overhead to natural light sources; workstation ergonomic issues from eye to screen distances to wrist and elbow support; a host of physical issues that come from sitting in one place too long – musculoskeletal strain, headaches, digestion problems, circulation in the legs, cardio-pulmonary issues from chest compression due to poor posture as well as shallow breathing; facial tension, especially around the jaw, the mouth, the yes and the temples; voice and throat issues – because the entire speech system is out of alignment; poor eating habits; caffeine and pill combinations in order to endure the hours ahead; nutrition – not enough or too much heavy eating along with too much comfort food to, again, endure the coming hours; wrong clothing – shoes too tight, pants or belt too tight around the waist, collar too tight; and don’t forget noise factors. Now mix all of the above into an environment…and then add the stress of having to negotiate the day with X amount of other human beings who are experiencing the same physical stressors and managing them in various ways who are quantitatively and qualitatively different from you yet are, like you, locked into the hours ahead trying in their best way to accomplish specifically outlined financial outcomes for the employer while struggling, perhaps in minor or in major ways, with their own personal dilemmas outside of the workplace. If the situation sounds a little to you like the switchboard in David Foster Wallace’s The Broom of the System, you are mainly correct. Here’s a little aside – on my very first morning on the job as a consultant, HR took me to a locker. She pulled open the door to reveal a couple of shelves full of Tylenol bottles. “That’s our stash for the week,” she said. 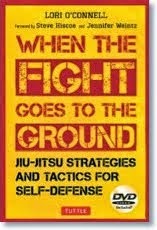 I do martial arts, and the people caught up in such environments are in an ongoing battle zone of sorts. Most of the time, they’re operating check points while in various states of stress, from hyper to dulled down. Or they’re on patrol. The boots become really heavy as does the equipment. They trudge along in various states of awareness. At others times, they might find themselves in a fire fight, and then the whole world it seems comes at them at once. In all these cases, there is always the element of the unknown…do I keep my job as the company transitions; is my position redundant; what about my performance report? ; what is management really thinking about me? ; when this project is over, what then? Office environments are actually worse now because so many people, especially young people just starting out, are under time-limited contracts. Sometimes it takes three to six months to find a six month job. Not good. I’ll have more to say about martial arts and the office environment in future posts. That you can count on. THE PRODUCTION LINE - Let’s swing over to one more environment – the production line. This entails everything from factories that assemble cars to places that manufacture the donuts we eat when we try to fill our stomachs but can’t get away from the computer screen. Monday: we drag ourselves in but a half an hour later, with known patterns re-established, we swing into action with full energy. Tuesday: some fatigue starts to set in; typical issues like the back, shoulder, elbows, etc., reach a peak of mild discomfort, not yet enough to interfere with sleep later on at home. Let’s reach for the pills. Wednesday: the vessel that is you truly begins to creak with flare ups all over the body map – arthritis, headaches, stiffness, numbness. Grin and bear. Plus more pills. Thursday: the thinking now is “one more day to tough it out”. Hang on, grab hold of anything you can. Friday: the weekend better offer enough time to recover, or we’re in trouble come next Monday. That’s why the “itis” in arthritis never really goes away. The body never has a chance to eliminate all the toxins over the short span of a weekend. 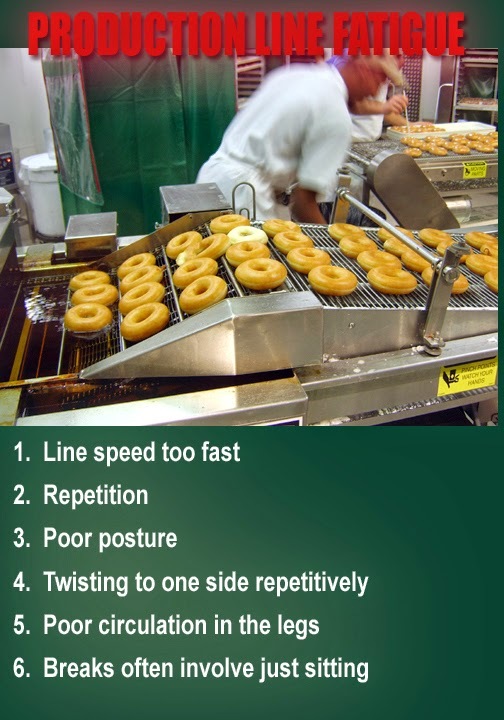 Four factors often tug and pull at each other in a production line environment – ergonomics, the production line schedule, management and production line employees. In an ideal setting, each factor interacts and exhibits true respect toward the other three factors. You can also view any given situation through two lenses – the health of the employees and the health of the company. Again, the most ideal is where both form a solid partnership. So I showed him, again, how to stretch out the bulk of his pain along with a bit of self-massage. A half an hour, later I came back and he was fine. 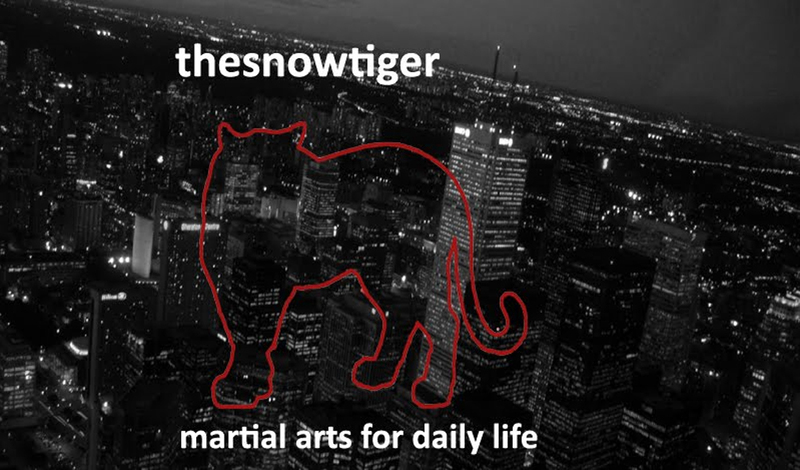 A question: if you’re a Taekwondo practitioner planning to attend the General Choi World Cup in Toronto, Canada April 12 – 15 (that’s a plug) put on by GM Park Soo Jong would you get out of bed, drive in – 20C , have a coffee, then walk right into the ring without stretching first? Obviously we need to tackle the cures as well. I plan to address those in the next post.